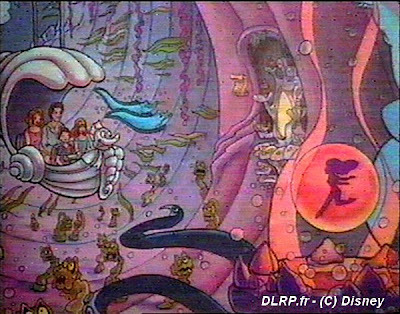 A looong time ago, i.e at the opening of Disneyland Paris, back in 1992, when one bought a map of the park, you could see a Little Mermaid attraction in the Fantasyland area with these words "future attraction". Well, it was such a "future" attraction that it never opened, and probably will never will, at least in DLP. But all is not lost as the idea to bring a Little Mermaid attraction at Disneyland, Anaheim is seriously in talks. But before we talk about this, let me tell you more about the attraction itself. 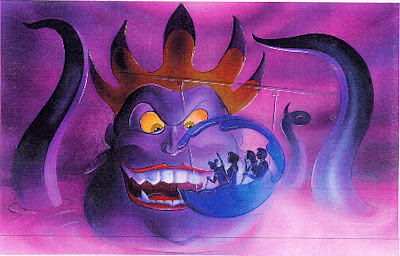 First, this Little Mermaid attraction concept is a dark ride. I should say a GREAT dark ride, i mean as "dark" as Peter Pan's flight or Snow White can be, but much much better. 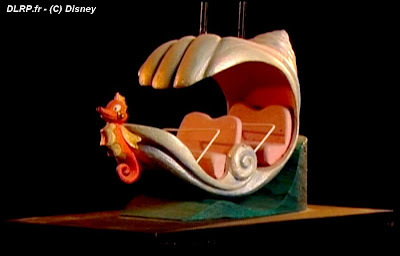 Then, the vehicles, designed like a shell, looks great, and will be hold by the top , just like Peter Pan's flight. Two , the ride will bring you under water AND over the water, and back again, thanks to the "dry for wet" WDI technology, a mix of lighting, lasers and smoke effects that give you the feeling you are under water, even if you're not really. The first scene will be over the water with the Little Mermaid meeting Eric for the first time. 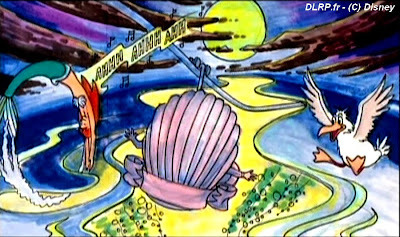 We will find back Ariel - the Little Mermaid - in her grotto, before entering in Ursula's threatening cave , the famous scene where she try to het Ariel's voice. The last scene will show Ariel and Eric living happily, a usual end for this kind of fairy tale. Looks like a great dark ride, doesn't it? Now, why was it never built at DLP? Well, back in 1993, when the park desperately needs some additions, the main problem of the park was to increase the capacity of the park. And they needed more than one attraction to do so. That's why they opened the Indy's temple du péril, Story book land, Casey Jr's train and Les mystères du Nautilus in the next two years. Then came Space Mountain, and once all of this was done....no more money was left to built this Little Mermaid dark ride! For many years, i thought that we will never see it built, that the project was dead, at least for DLP. Then one month ago, at the opening of the Finding Nemo's submarine voyage at Disneyland, Ed Grier in an interview to a web site cited "...his personal favorite as The Little Mermaid... "The Little Mermaid continues to be a Disney classic," he said during a roundtable talk at Main Street's Opera House, noting that the animated version of the Hans Christian Andersen story has been adapted for Broadway. "Imagineer Tony Baxter has done great work on a Little Mermaid-based attraction. Have we officially drawn plans up? No, we haven't. But I think we can one day." Mind you, this doesn't mean that a definitive decision has been done to bring the Little Mermaid attraction for sure at Disneyland. So don't get too excited right now. But the good news is that legendary imagineer Tony Baxter was recently named as the Imagineer in charge of Disneyland - to supervise Disneyland's development. 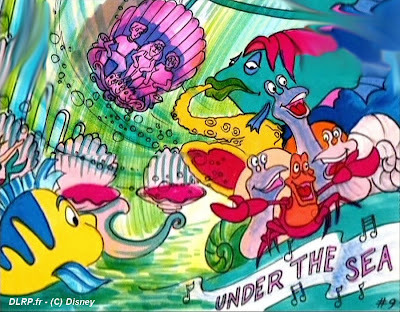 And, as the Little Mermaid project was created by Tony Baxter AND that it is a great dark ride project, my feeling is that it's time again to cross our fingers and hope that Ed Grier will make the right choice between eventual different concept around the same theme. 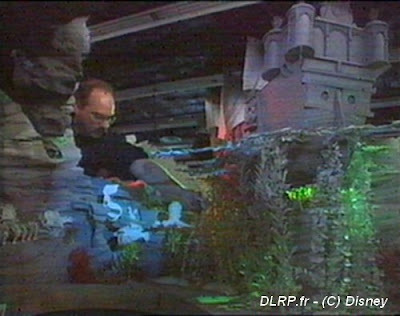 Those of you who bought the Platinum edition of the Little Mermaid dvd last year may have seen the special feature about this attraction project - the images you've seen on this article are screen capture done by the very good dlrp.fr web site - you will find a direct access link to it in our "links" section on the right. 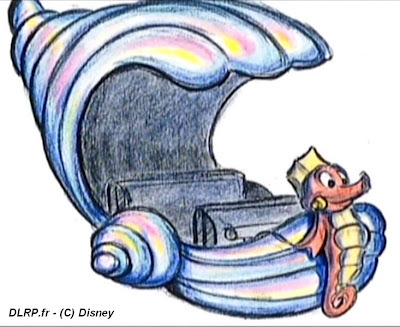 In that special feature it was possible to see a video of a "virtual creation" of the ride, and it's time for you now, to have a better look below to this Little Mermaid attraction concept. You won't get any closer to it until its eventual creation at Disneyland. 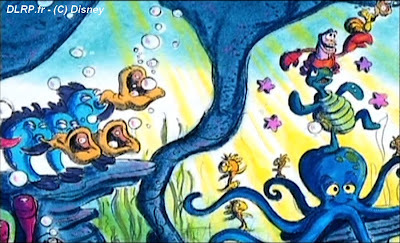 Photos and video: copyright Disney. I think if this attraction ever gets created at the Disneyland Resort it will be at DCA. It might be built there because of a more suitable theme at Paradise Pier. The attraction might be built over in the Timon parking lot with the entrance facing the lagoon. Possible....but not sure, for two reasons: 1) the theme and the characters are a perfect "Magic Kingdom" theme, although i think there is already a kind of little mermaid restaurant at DCA, and 2) the attraction is Tony Baxter baby, and Tony is not in charge of DCA, it's another Imagineer. So, my feeling is that Tony would really prefer to have it built in Disneyland... however if there is no other choice to get the attraction built, it could come to DCA. Personally and just for the fun, i'm still betting on Disneyland more than DCA...anyway, we'll see what happen! I love this site... it has become my go-to website for Disney updates, photos, "never-built" attractions and concept art. Thanks for your work in putting it together. This would be awesome!!! Do you think that this ride might eventually make an appearance in the Magic Kingdom at Disney World? I guarantee that my 19 year old daughter and I would ride it hundreds of times! I'm hoping this attraction will be build at Disneyland Resort Paris. It's designed for this park en it will be the addition they need. 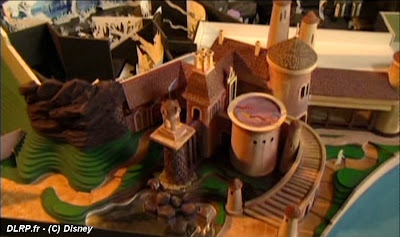 It will make fantasyland's design complete and the park really need some big new attractions for the capacity. The lines are growing very fast with the 15th and I guess next year wit Tower of Terror it will be too busy. WDI execs have said that the Little Mermaid attraction will be part of the DCA makeover/expansion and will replace Golden Dreams.